The Legend of the Faire Isle. . .
Long ago there lived women known as the Daughters of the Earth, revered for their knowledge of healing and white magic. They lived in a time when men and women were deemed equal and shared in the governing of their kingdoms. But as time passed and men came to dominate, women were denied more of their rights to govern and learn. A brave few persisted, passing on the secrets of the ancient learning from mother to daughter for generations. It was dangerous for the Daughters of the Earth were no longer revered as wise women, but instead called witches. From Brittany’s misty shores to the decadent splendor of Paris’s royal court, one woman must fulfill her destiny–while facing the treacherous designs of Catherine de Medici, the dark queen. She is Ariane, the Lady of Faire Isle, one of the Cheney sisters, renowned for their mystical skills and for keeping the isle secure and prosperous. But this is a time when women of ability are deemed sorceresses, when Renaissance France is torn by ruthless political intrigues, and all are held in thrall to the sinister ambitions of Queen Catherine de Medici. Then a wounded stranger arrives on Faire Isle, bearing a secret the Dark Queen will do everything in her power to possess. The only person Ariane can turn to is the comte de Renard, a nobleman with fiery determination and a past as mysterious as his own unusual gifts.Riveting, vibrant, and breathtaking, The Dark Queen follows Ariane and Renard as they risk everything to prevent the fulfillment of a dreadful prophecy–even if they must tempt fate and their own passions. Skilled in passion, artful in deception, and driven by betrayal, she is the glittering center of the royal court–but the most desired woman of Renaissance France will draw the wrath of a dangerous adversary. Paris, 1575. The consort of some of Europe’s most influential men, Gabrielle Cheney is determined to secure her future by winning the heart of Henry, the Huguenot king of Navarre. As his mistress, Gabrielle hopes she might one day become the power behind the French throne. But her plans are jeopardized by Captain Nicolas Rémy, a devoted warrior whose love Gabrielle desires–and fears–above all. She will also incur the malevolence of the Dark Queen, Catherine de’ Medici, whose spies and witch-hunters are legion, and who will summon the black arts to maintain her authority. With the lives of those she loves in peril, Gabrielle must rebel against her queen to fulfill a glorious destiny she has sacrificed everything to gain. Alive with vivid period detail and characters as vibrant as they are memorable, The Courtesan is a sweeping historical tale of dangerous intrigues, deep treachery, and one woman’s unshakable resolve to honor her heart. France, 1585. She is the youngest and most powerful of the “Sisters of Faire Isle,” women known far and wide for their extraordinary mystical abilities. Skilled in healing and able to forecast the future of those around her, Miri Cheney has returned to her ancestral home to take refuge from a land devastated by civil war–and to grieve for her family, driven to exile. But she cannot hide from the formidable new power threatening to seize control of France from the dread “Dark Queen,” Catherine de Medici–a diabolical woman known only as the Silver Rose. Miri has no choice but to turn to the one man she distrusts as much as she desires: Simon Aristide, the charismatic witch-finder who is now himself the hunted, and who has reluctantly made an unholy pact with Catherine. Miri must defy throne and family to save all that she loves most–and command a future greater than she could ever imagine. Vibrant with stunning historical detail, alive with characters as richly passionate as they are compelling, The Silver Rose is a sweeping, exquisitely wrought tale from a mesmerizing storyteller. In a time of intrigue and betrayal, the huntress is on a quest that could jeopardize two empires and two great queens: Catherine de Medici and Elizabeth The year is 1585–and prophecy has foretold the coming of a daughter of the Earth whose powers are so extraordinary they could usurp the very rule of the Dark Queen herself, Catherine de Medici. Dispatched from Brittany to London, Catriona O’Hanlon, known as the Huntress, must find this mysterious young girl and shield her from those who will exploit her mystic abilities, which have the potential to change the course of history. Catriona’s skill with weaponry is all she has to protect herself and her young charge from spies who snake through the courts of Elizabeth I, the Virgin Queen–including the girl’s own father, whose loyalties are stretched to the breaking point. But Catriona will soon face menacing forces and sinister plots unlike any she has ever encountered. The Huntress is an unforgettable portrait of power and passion–and one woman’s courage to risk everything for those she loves. As war and treachery loom, an ambitious man’s mission threatens to topple two dazzling realms and their formidable rulers: Catherine de Medici, the Dark Queen, and Ariane, the Lady of Faire Isle. It is 1588, and as the Spanish Armada prepares to besiege England, Paris balances on the brink of revolution. 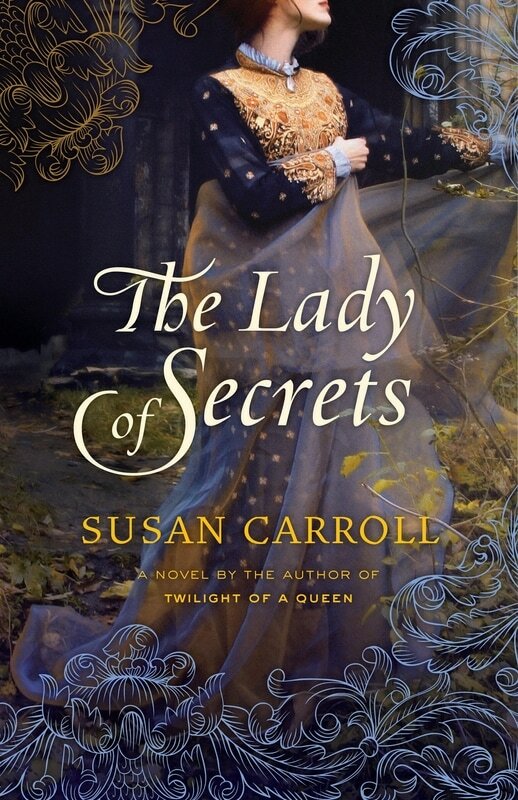 To maintain her grip on the throne and on the dark magic that has become her obsession, Catherine de Medici turns to Louis Xavier, a ruthless corsair who was schooled in the dark arts and has mastered piracy along the Spanish main. But Louis’s basest instincts are held in check by the kindness of Lady Jane Danvers, a British exile whose innate sense of honor is but one facet of her complex and passionate nature. On Faire Isle, Ariane Cheney, unaware of the escalating threat from the Dark Queen, struggles with the task of protecting the daughters of the earth and their vast store of ancient magical wisdom. Weak and desperate for an advantage, the ailing Catherine makes a devil’s bargain that will cast a shadow over all. Queen Catherine de Medici is dead, and for Meg Wolfe—successor in a line of legendary healers and mystics known as “daughters of the earth”—it is a time of new beginnings. She strives to be ordinary, invisible in the mists of Faire Isle, and is determined to put the terrifying days of a wicked mother and turbulent childhood behind her. But soon a summons from King James will rekindle a menacing power from the past, bringing haunting visions of a nightmare already unfolding—and a shattering mystery steeped in magic that will determine a destiny from which she cannot hide. Meg’s task: Save the king from the most insidious form of treachery, invisible to those who do not possess Meg’s extraordinary gifts. But as Meg discovers, there are more sinister motivations at play in the king’s world. Torn between two very different men whose motives and secrets are tied inexorably to her own fate, Meg learns that she can no longer trust anyone or anything—not even her own heart.